Air seeders, Figure 8.6, have become the machine of choice for planting wheat and other crops in large fields. Seeders with effective widths of 70 to 100 ft are being used. The basic design is a seed cart pulled behind a field cultivator or other secondary tillage machine that has soil engaging tools mounted on shanks. The seed cart may have one or more hoppers. 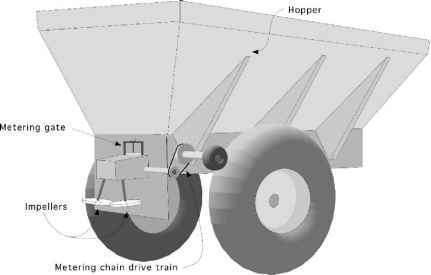 When multiple hoppers are used one hopper will be for seed and the other(s) can be used for fertilizer or other materials. Each hopper will have either a single ground driven metering unit that splits into multiple air streams, or multiple air streams with a metering unit for each. At the metering unit the seeds are divided into several tubes and flowing air delivers the seeds to a splitter manifold. The splitter manifolds divide the seeds into a stream for each shank. As air seeder technology has developed, more sophisticated soil opening devices and metering units have been developed, but the basic design is the same. Most manufacturers state that air seeders can be calibrated using stationary or mobile methods, but the seeding rate for some air seeders calibrated stationary may be less than the actual rate in the field. For this reason the mobile calibration is recommended.